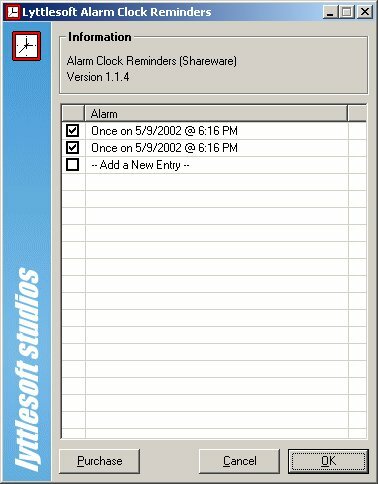 Alarm Clock Reminders - Quickly and easily set reminders, schudule programs or even play sound files, perfect computer alarm clock reminders software for you ! Have you ever forgotten about a special someones birthday? Or have you ever wished you could find a reliable program that could schedule alarms with mp3 or wave files? Or maybe you wished you could leave your computer on at night and have it shutdown itself automatically at a particular time? Alarm Clock Reminders is just for you ! Help remember all those important events by setting reminders to alert you. Schedule your computer to be shutdown at a specific time! Best used when downloaded a file, or defragging the hard drive. Set wake up alarms on your computer! You can even customize it with an sound file of your choice!! You can email your alarms to a friend, or to yourself! And you can quickly and easily save them in your reminders list! Set Alarm Clock Reminders to chime on the hour. Make sure no-one has access to your alarms! You can schedule alarms Daily, Weekly, Monthly even Yearly! Quickly and easily schedule external programs on Alarm Clock Reminders at a certain time! Hours Clocked - World time zone clock software hours clocked is a handy time card calculator program.